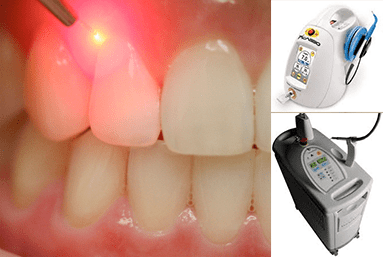 Our office offers two types of lasers, the Diagnodent and DioDent II. The Diagnodent is a laser used to detect surface decay. Decay between the teeth is detected with x-rays. Since the use of fluoride made enamel so strong, an extremely small hole may not be detected by an explorer. The diagnodent helps detect the small areas so we can fill them before they get too deep. The soft tissue laser “DioDent II” is used to treat gum problems. Examples of this are frenectomies, removal of gum abnormalities like fibromas, treatment of canker sores, etc. Use of a laser also speeds up the healing process.